The Alice M. Thomas Scholarship was started by Dr. Clifford DeBaptiste in honor of Mrs. Thomas for her many years of service in the Guidance Office at Henderson High School. This scholarship is awarded to a student each year who exemplifies Mrs. Thomas’ awareness for social justice, academic achievement and community involvement. The primary purpose of this fund is to provide financial support to students graduating from Henderson High School in West Chester, PA pursuing post-secondary education. Born and raised in West Chester, Alice Thomas is a firm believer in the power of what a community can accomplish when it comes together. 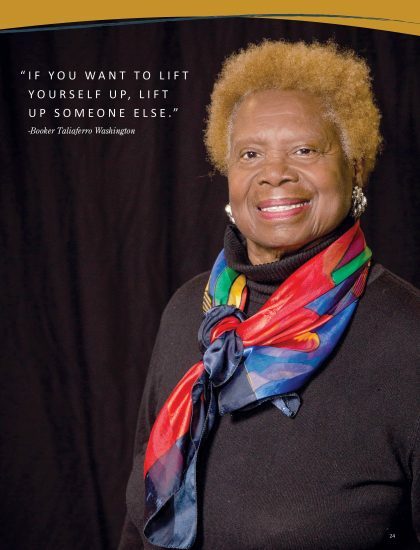 Mrs. Thomas has been involved in her community since childhood and continued into adulthood by working in the guidance office at Henderson High School in West Chester, PA. She focused her career on helping children while also supporting efforts for social justice, integration, and minority representation. While working at Henderson, Mrs. Thomas saw the value in bringing people together. Mrs. Thomas strove to integrate Henderson High School into the broader West Chester Community. She altruistically, “served as the bridge between the school and community”. In 1978, Mrs. Thomas helped form the Black Student Union because there was a lack of minority leadership in the student government at that time. Mrs. Thomas says, “I wanted to give my students an identity at the school and make them see that they could do anything anyone else could do”. In 1991, four African American students became the first minority students to represent the student body. Mrs. Thomas feels the Black Student Union was one of the most impactful undertakings of her career. It was not without challenge, as there were setbacks along the way. Mrs. Thomas once again brought the community together to fight to get the names of the black student officers in the yearbook. Now retired from Henderson, Mrs. Thomas looks back on this time fondly and looks ahead to new opportunities for racial justice in her community. In 1998, Dr. Clifford DeBaptiste, former West Chester mayor, distinguished community leader, and personal friend to Mrs. Thomas, started the Alice M. Thomas Scholarship Fund to honor students that exemplify Mrs. Thomas’ awareness for social justice, academic achievement and community involvement. The fund is dedicated to the 35 years of service Mrs. Thomas gave to the guidance office at Henderson High School, as well as her continued involvement with the school and community. Mrs. Thomas hopes her scholarship, and others like it, give students the means to attain higher education. Mrs. Thomas wants past recipients of her scholarship to serve as role models for current Henderson students who want to pursue higher education. Mrs. Thomas is dedicated the success of her students and the West Chester community.